Belmor Park is an age-qualified community that offers an active friendly lifestyle. Whether you are interested in shopping, parks, amazing dining options or high quality medical facilities they are all less than a mile from our front gates. Enjoy golf? Bring your clubs! Belmor offers a 9-hole Executive golf course for their residents to enjoy. Imagine waking up each morning and stepping right onto your own golf course. This is a golf course has no green fees and is for resident-use only. Belmor Park offer a variety of amenities to suit the needs of their residents. Come work up a sweat in the exercise room and follow it with a relaxing dip in the indoor swimming pool or Jacuzzi. Enjoy the social scene of their numerous organized events and functions. New and used manufactured homes are available for purchase throughout the park. If you prefer, you can choose a lot and purchase a new home from their dealership. Belmor Park will help you through each step of the way in becoming a resident of the facility. Tours are always available so you can see what the park has to offer. The park also has a library that offers plenty to read and a place to relax or play games. There is also a craft room and for security the park is a gated community. Some popular activities are the coffee and donuts meeting, Yak-n-Yarn and many more fun thing to do. 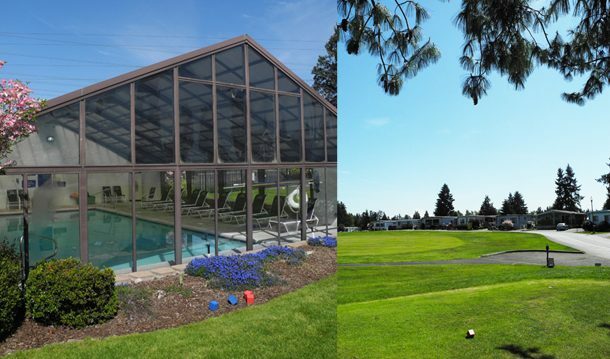 Belmor Park Golf & Country Club is located at 2101 S. 324th St. Federal Way, WA 98003. For more information about what Belmor Park has to offer call them at 253-838-0517.